One of the most prominent forces in African-American gospel music in the 20th century was the team of Sallie Martin (1896-1988) and Kenneth Morris (1917-1988). Martin worked with Thomas A. Dorsey, composer of the classic, “Precious Lord, Take My Hand” (UM Hymnal, No. 474), bringing not only her performance skills to his trio, but also business acumen to his music store where she increased the sale of his songs and made his business more profitable. Morris was a native of New York City, where he studied at Manhattan School of Music. Though his roots were in the church, he formed the Kenneth Morris Band, a jazz band that played that played at hotels, lounges and restaurants. At a series of performances in 1934 at the Chicago World’s Fair, he contracted tuberculosis. Morris remained in Chicago to restore his health, taking a job as a music transcriber. It was here that he met leaders in the gospel music community including Lillian Bowls and Charles Pace. Morris was hired as a choir director by the Rev. Clarence H. Cobb, pastor of the First Church of Deliverance. From this venue, Morris became a practicing church musician and a pioneer in black gospel music who was credited for introducing the Hammond Organ to the gospel sound. Martin sang in his choir. Cobb persuaded Morris and Martin to go into business together. Though she had much natural musical ability, Martin had no formal training. Morris furthered her singing career by writing and arranging songs for her. In 1940, the two joined forces to form the publishing company Martin and Morris Music, Inc. That same year, Martin founded the Sallie Martin Singers. According to the American History Archives Center, Martin and Morris “were co-owners of the nation’s oldest and continuously-running Black Gospel music publishing company” (1940-c. 1988). Martin traveled most of the time with her singing group, promoting the songs published by the company. Morris resided in Chicago working as an arranger and composer, and with his wife, Necie, handled the day-to-day business of the company. 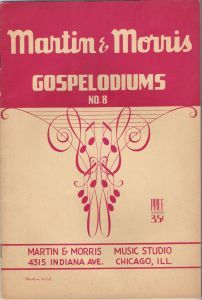 According to scholar Horace Clarence Boyer, the Martin and Morris Company was particularly important for black gospel music during the peak years of 1945-1965, because this was one of the few companies that would publish the music of other African-American composers. Through the company, the music of many gospel music greats was circulated around the United States and beyond. The second stanza acknowledges God’s presence in the face of persecution and abandonment. The final stanza rephrases some of the ideas of earlier ones, stressing again “God’s holy power” in ones life. Though coming from an African-American context, the message of the song extends to others. Boyer notes that this is Morris’ “most commercially successful composition. It has been translated into twenty-four languages and is sung all over the world.” Among the many recordings of this song available today, one will find renditions not only by Mahalia Jackson, but also Pat Boone and Johnny Cash. “Yes, God is real” expresses the surety of faith of many Christians. *© 1944 Martin and Morris; administered by Unichappell Music, Inc. All rights reserved. Used by permission.